Home » »Unlabelled » Nintendo 3DS by November 19, 2010? Nintendo 3DS by November 19, 2010? 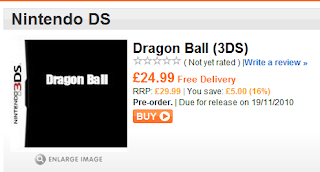 On Play.com a Dragonball game has been put up for pre-order but what's interesting is that they included the release date November 19, 2010. Judging from this we can say that the 3DS could be released on that day but seeing as this was not announced as a launch title, It could be anytime before then too..